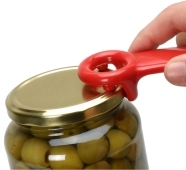 The JarKey (or JarPop) is a jar opener that opens jars, not by twisting the lid, but by lifting the edge of it, so that the vacuum inside is released. When the vacuum is released, it is easy to unscrew the lid. The JarKey is patented and design registered in numerous countries throughout the world. "...Gently levering the JarKey against the rim of the lid releases the vacuum inside the jar, taking all of the hard work out of twisting off the lid!" "...The JarPop earned an excellent score for ease of use, better than the others!" "...The JarPop Makes it much easier to open a screw-top jar by lifting the lid slightly to break vacuum seal... The lid now is a quick spin to freedom!" "...Required very little effort by the user and performed excellently for releasing a variety of jar lids!" "...A much better invention than the older types where you need big hands if the lids are big. Here the lid size does not matter, even if you have weak hands!" "...Is good holding on for hands with rheumatism. Its easy opening jars, when you have removed the wacuum with the help of JarKey!"